Hello! It's me, Marnie. Welcome back for day two in our week of starting points. I hope that you enjoyed the color schemes yesterday and had fun building a layout with color as your starter! I took the challenge, too, and made a layout using five colors you might recognize from the extras from yesterday. Honestly, I usually find a scheme after I look at my photo, so this starting point felt a little like putting the cart before the horse for me, but I liked it! And now, our second challenge and starting point: one word. Today we are going to do a classic writing assignment. 30 seconds, a blank piece of paper, a pencil, and one word to spark a memory. "That's it?" you ask. And yes, I say. That's it. Close your eyes. Let your mind wander and see what happens. Here are two words and their accompanying layouts. Straws make me think of slurpees and my time in the back of a pickup truck after the Farmer's Market as a kid. But I have already scrapbooked this, so I sat a minute more. Then I got to thinking about Pic-A-Pop and started writing about that. But as I wrote, I realized I wanted to include more than just the pop, and so I backed up and added my memories of pizza nights. Which together rounded out to include a little about my mom being a working mom. And now I have a layout that captures a memory oft remembered, but not yet scrapbooked. (I don't have very many pics of my childhood, but did find one with all three of the kids in it, so I used that one.) You may notice that there is nary a mention of straws in the journaling. It was just a starting point on this one, not at all the end point. And that is just okay. I grew up in Canada where winter is more than just a season. As I began to write, I ended up with a bunch of disjointed tidbits about winter that didn't fit into a particular layout. But did work under the general heading of winter. So I went with that! Unlike the straws layout, the starting point word is more than just a little evident here. This just shows us how inspiration can spark or be; either way works great! Knowing I didn't have a childhood photo to go with this layout, I looked back to a trip we took home to Canada a couple of years ago. In this photo, Lavender is wearing my childhood snowsuit, and she and Nigel are riding on my childhood toboggan, so it seemed liked the perfect accompaniment to my winter childhood memories. I hope you will try it and see how much fun it can be! I would love to see what you come up with. Thank you, for stopping by and for being a part of our write. click. scrapbook. family! I really enjoy using ribbon and trim on layouts. I recently received some twill from Come On Get Crafty, in a beautiful assortment of summery colors and thought it would be fun to use all of the colors on one single layout. That's when it struck me that I could cut them to different lengths and use them to create a backdrop for my photo, similar to the concept of creating a background with scrap paper strips. That is my mom on the far left with her two cousins. They still hang out today and cause trouble, lol! I have found the easiest way to adhere ribbon to paper is to stitch it down or use glue dots to adhere it. I stitched down these ribbon strips, although it is difficult to see in the close-ups. Once I had the ribbon in place I added my photo, title and embellishments. I placed a glassine bag behind the photo which I used to store a journaling tag. If you have a stash of ribbon, I challenge you to make a backdrop on your layout! Can't wait to see what you create! Hello everyone! Thanks for coming back and joining me for another day in embellishment week. Today we are going to look at wood veneers, which are wildly popular right now, and the tried and true chipboard. Both come in many shapes and sizes and are a great addition to any layout. The beauty of wood veneers is that they look great all on their own, without any altering. For this layout, I simply accented a couple tags with natural snowflake shapes and also tied twine around one by the title. Do you see a couple other techniques we talked about earlier this week? Yes! The colored hanging tags accented with snowflakes and the fabric brad used for the center of the "o" in the title. All fun easy ways to add extra touches to your layouts and get all those cute embellishments on a layout to enjoy. Many of the basic shapes that are available in wood veneers have open centers. Try using the open space to highlight something on your photo, journaling or other important detail on your layout. I used the heart to draw attention to the sun which makes the sky look like it is on fire. It was also the inspiration for the play on words I used in my title. Wood veneers are easy to alter with spray mist. It is my go-to method for coloring them. For a more intense color, spray lightly, let dry and spray again a second time. On this layout, the brightly colored wood veneer stars frame the photos making them the focal point. The title is also made of wood veneer with a brad used as part of the punctuation! I took full advantage of the open centers of all the circle wood veneers on this layout. One houses part of the title, one is home to my journaling and the other is backed with patterned paper that coordinates with my theme. A couple veneers were stitched down, which is functional and decorative too. Finally, look for ways add similar shapes in different mediums for visual interest. Here I mixed stamped asterisk shapes with asterisk wood veneers. I like the way the two work together to lead you through the layout. Let's not forget our beloved chipboard. Some manufacturers offer chipboard in colors, patterns and designs that coordinate with their paper collections. Other manufacturers offer natural chipboard giving you the option to paint them, cover them with patterned paper or even leaving them natural. On this layout, I created a scene with a tree chipboard. To dress it up I added small punched flowers accented with rhinestones, an owl perched on a branch with a kite tied off next to the owl. It's fun to alter the look of chipboard with paint too, like I did with the alphabet chipboard in the title. With just a few simple touches you can really dress up chipboard that coordinates with a line. I used several pieces to create an entire scene that coordinates with the theme of my layout. I added a couple small details that make a big difference to dress them up. Take for instance the cute egg chipboard banner...the addition of the tied seam binding on the ends really sets it off. I also used a piece of chipboard as the background for the title and layered a small birdie chipboard on top. These simple little touches make all the difference. Chipboard can be beautiful left natural too. On this last layout, I left the chipboard unaltered but adhered small pearls to create a choker necklace on the silhouette shape. It was just the right detail for my vintage layout. Thank you for visiting today. I hope you are inspired to get out your stash of wood veneers and chipboard and add them to a page. 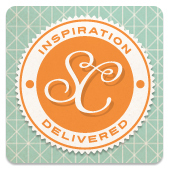 I'll see you back here tomorrow for our final day of embellishment inspiration and a giveaway! No Holiday Photo? No Problem. Merry Christmas everyone! Aliza here blogging at wcs for the first time on this special day. I hope you are all snuggled and warm, and enjoying some fabulous holiday memories in the making. Now what can a nice, Orthodox, Jewish girl like myself possibly have to share about scrapbooking on Christmas day? I don't really have Christmas layouts of my own to share with you, true. But, I do have some experience scrapbooking holiday memories without photos of the actual day. See, according to the Orthodox tradition, on many important Jewish holidays, like during the Passover Seder, and Rosh Hashana, taking pictures is not allowed. For years, while I scrapbooked bike rides, and first days of school, and general cuteness, this important part of our family heritage went undocumented. I needed to find another way to tell this story. Now, there are also lots of holidays where I can take pictures, like Chanukah and Thanksgiving. But I sometimes run into another problem. I am not a great multitasker. So, when family and friends and general celebration is afoot, I sometimes forget to take pictures. Or, when I do take them, the lighting and composition are not always great, and, well, not everyone is always looking their best. So, if you are busy today enjoying your family and your holiday, and you don't get behind the camera, I say, tell your story anyway. I use this phrase a lot as a preschool teacher, and it is equally helpful for us here, as well. I don't have any photos of our Seders in progress, but I do have a photo of the table set before the holiday began, and I have my words to describe what this table and this room look like just a few hours later. And part of the story is that it looks the same every year. I used similar approach for the holiday of Shavuot. More flowers for the photo (because flowers are always pretty), and words to tell the story of what made that particular holiday special. No fancy story telling. Just a list of some of the things that happened. There is a lot of tradition surrounding a holiday that happens before the holiday itself begins. Like every year, before Passover, we bring out a box of all the Passover projects that my kids have made at school over the years. And, every year, they love to look back at their old work. In my home, though, and perhaps yours too, capturing all the REAL preparations, requires one more step. I'm sorry, did she just say "embrace the underwear?" Yes. I did. Because here is something else about my family. As these beautiful, touching, holiday memories unfold, not everyone is fully dressed in their holiday best. What can I say? We are not a formal bunch. In years past, I might have rejected some of these photos as "unscrapworthy," but I find the story they tell, and the relationships they document, too complelling to let them go any longer. Did I mention we are not a formal bunch? And if you can embrace the underwear, you can certainly embrace some poor lighting and composition, too. Jenny said that living in Minnesota in a small house with few windows, lighting and composition are always a challenge. So she prints her photos small to make up for it. So, if you miss some photo ops today, you can still tell your stories of the day. And if your home and your family, like mine, do not always look like a page out of Martha Stewart Living, embrace them and their imperfections because they are yours and they are real. I do have one Christmas layout that I can leave you with today, because we do have one Christmas day tradition. Every year, we turn the channel to TBS and watch A Christmas Story. Did you know that next week is Geography Awareness Week? Probably not, unless like me, Vivian, you are a geography geek. As a kid, I always had my nose in an atlas of some sort and grew up to be a social studies teacher/curriculum coordinator/instructional coach whose passion has always been in the area of geography. Maps lie at the core of geography, so, as you might imagine, I was thrilled when the trend toward map-themed products started a couple of years ago in the papercrafting industry. We'll be exploring that trend this week, with a different focus each day. So...let's dive into our exploration of maps in the background. One way to use a map in the background is to use it for the specific location(s) depicted, using the map to help tell the location piece of your story. You may have already seen this layout I created a while back, but I still love it and it's a great example of using a map for the specific locations depicted. This layout tells the story of my grandfather's family's journey to the United States. Another great way to use maps in the background is for layouts about travel in general, journeys, or places you go. As you can see, maps are very popular with the whole write.click.scrapbook. team! Are you already using maps in the background? If you're using them literally, try using them figuratively. If you're using them figuratively, try using them literally. If you're not yet using maps, give it a try! Hello and welcome to our final September Saturday! We have had a wonderful month here and hope that you have had as well. While we love our Summertime Dailies, our week long author weeks are near and dear to our hearts, and this month has been spectacular! Marnie got us off to a good start with a week of preparations for a "new year." Then Francine provided us all with a much appreciated photography skills week. Monika spearheaded an inspirational week demonstrating the many uses of twine which lead us right into this technique week filled with Kathy's amazing talents, hints, and suggestions. And as if that wasn't enough, we had our Saturday workshop challenges. Did you practice adding in details as per Amy's helpful article? Or maybe you were inspired by Lisa's monthly photo challenge? You still have a couple of days before the calendar changes to put together a plan for the month of October... Lastly, Marnie brought you three more page starters, with a sketch, a color combo, and a design trend. It really has been an incredible, information-packed, inspiration-filled month. Before we welcome October, as with each month's end, today we are taking one last walk back through our gallery. Let's look back at Looking Back! This month we are going to maintain our lists, but with a twist. Using our gallery layouts, we've put together three lists of ten things we can try on our layouts. 30 more reasons to scrapbook!! And to help you create some fun pages we have a new printable for you that accompanies our theme of Looking Back. You may download it here. And for extra points, see if you can name the tv show that inspired the 90s tag! Have a terrific weekend and we will see you back Monday for our brand new gallery! Hello! Welcome to the final day of vintage photo week. So far, we've covered a variety of ways to tell the stories of your ancestors. Today, I want to talk about bringing those vintage photos out of the albums and using them in your everyday life. I spent some time surfing the web and collected some ideas that I think you will find inspiring and really get you thinking about other ways to use your vintage photos. I like to incorporate photos into my home decor. A couple easy things I like to do is display a layout or photos on my old typewriter. Above my typewriter I have a frame backed with chicken wire that I use to display favorite photos. Using my scrapbooking supplies I decorated each photo. I use clips to attach the photos to the chicken wire, making it easy to switch them out for different themes and seasons. Here are a couple more fun ideas using frames. Perhaps an old window is more your style. Take a look at this family tree wreath, complete with the names on fabric leaves. Vintage photos hanging from branches is a beautiful center piece. How about display photos in jars? Create a banner with photos and memorabilia, if you have any, to really make it special. You could even display them in vintage luggage. How about making some coasters featuring your favorite vintage photos for everyday use? These would make a great gift too. You can also use the photos to make a meaningful focal point for a milestone birthday! If you are feeling really ambitious you could try making a table runner. Isn't this amazing? Use one to personalize a wrapped gift. It's the perfect touch! This is just the beginning. There are so many amazing ideas on the web. I hope a few of these projects inspire you to use some of your photos for decor, parties and gift giving too. I have one final note before I wrap up the week; please make sure you are using copies of your vintage photos in all of your projects. Without a negative, they are irreplaceable and should not be altered or damaged. Thank you for hanging out with me this past week and allowing me to share my love of vintage photos with you! Hello! Welcome to the another day of vintage photo ideas. The last couple days we've discussed telling the stories of our ancestors, and how to include journaling for photos that are missing stories. Today, I want to talk about making connections! Over the last couple days, as you looked through your vintage photos did you notice any traits or activities in your ancestors that are similar to your family's interests and traits today? For example, I have a photo of both my mom and I playing with a doll as a child. Even though we are separated by 25 years in age we both liked playing with dolls when we were young. Putting both of these photos on a page and journaling about the similarities is my favorite type of page to make. Here is an example of using photos from different generations to show a shared activity. What little boy doesn't like to dress up like a cowboy? This layout shows three generations of little cowpokes; my son, husband, and father-in-law. Aly Dosdall shares a wonderful layout of three generations of mothers and daughters. Aly listed all of their shared interests and traits on the circle around the photos. On this layout I wanted to show the strong resemblance between my son and my dad and the personality traits they share. Someday future generations will look at this page and they may be able to pick out similar traits too. I would like to leave you with a Chevrolet clip celebrating 100 years with then and now! Doesn't that clip make you want to dig through your photos looking for connections so you can make a layout? It certainly shows, that although some things change, others stand the test of time and remain the same. I'll be back here on Friday for the final vintage photo post. I hope you will join me! Hello everyone! Welcome to another day of vintage photo fun. I must admit I'm having fun changing out my bio picture with vintage photos. Today I'm featuring my mom (click on the photo to enlarge it) on her very first day of school. Yesterday I shared several ideas for telling meaningful and engaging stories from your past. You may be thinking to yourself, "I don't have any stories for my photos and there isn't anyone that I can ask". Well, I'm here to tell you, you can still use them, and in some cases, even create meaningful layouts. Creating a meaningful layout when you don't have a story is actually pretty easy to do if you take cues from the fashion, decor, trends and surroundings in the photo(s). Take this layout, for example. When I was looking at these photos I realized I didn't know anything about them, except who the people were and a couple dates. However, I was fascinated by the clothing of my grandma and my husband's grandma so instead of creating a page saying "this is grandma in 1935", I decided to journal my observations and thoughts about the fashions. Here's another look at this approach. In this photo of my grandma I was intrigued by the little details I saw; the flag hanging from the porch, the rocking chairs (one just the right size for her), and the doll and carriage. I simply made my observations into the journaling and even drew inspiration for the title from the flag hanging in the background. Including your observations and perspective is a great way to make it meaningful and draw the reader into your layout, making them want to linger and really study the photo. Another idea, is to simply state the facts about the photo. Now, I could have journaled about our Easter traditions during my childhood, but I had already done that on another layout, so I decided to list the facts that I saw in this photo of my sister and I.
I thought I looked like I was pretty interested in what she was doing so I created a little blurb about that in my journaling. I also knew this was my first Easter since I was sitting in a bouncy seat so I used that for the title and added the date. I don't have many photos of myself as a baby, so I'm happy I included this in my album, even without a story. What if there aren't any clues in the photo? You can follow Paula Gilarde's lead and journal about the mystery. I love the creative approach that Paula used for this photo of her dad with a parrot on his shoulder, even stating that it didn't seem like something her Dad would do. Now that you've been looking through your pile of vintage photos you probably have quite a few people that you can't identify. Aly Dosdall shares a great solution for using all those "nameless" faces on this layout. I love how how Aly included every single person that she didn't have a name for and turned it into an opportunity to journal about why it is so important to tell her story! Genius! I hope I have shown you that it is not only ok, but that you should be including heritage photos that don't have a story. They are part of your past and you and future generations will enjoy looking at all the people, places and things from days gone by. Tomorrow, I'll be sharing my favorite way to use vintage photos. I'll see you then!